So i am afraid i have jumped on the VC band wagon of late, i wanted a vc army when i returned to the hobby back in may but my local GW manager suggested i hold out a while. Just gonna bung a few photos in here i guess, give you a "Done so far" kinda thing. Let me know if you would like WIP pics. 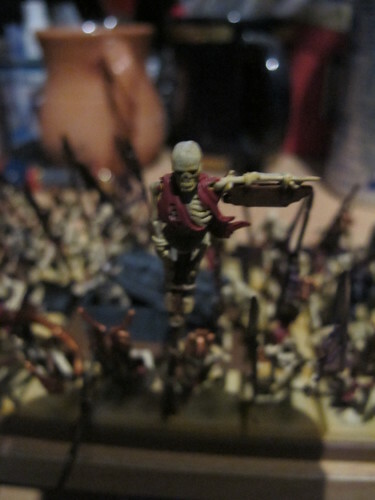 The unit of 40 skellies i painted up (with a unit filler and some tomb stones) whilst listening to 5 back episodes of the painting tabled all in one session. By the end i felt like one of the unit. A closer up and horrendously over exposed picture of the unit filler. 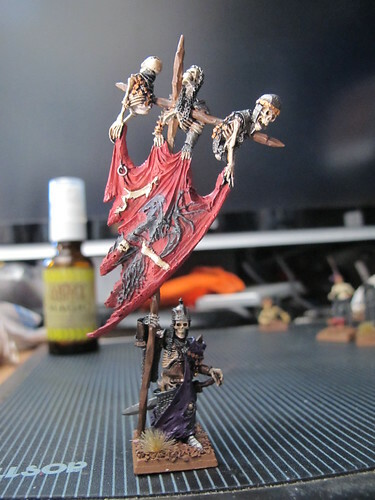 A super blurry pic of my custom skellie banner pole. Horrah for left overs from the giant kit. 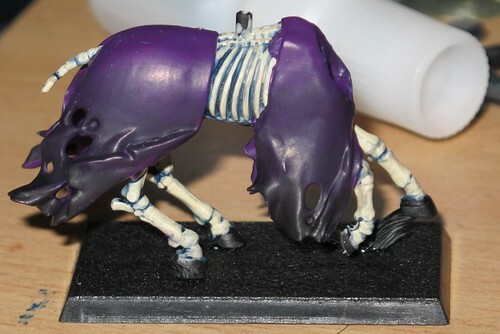 The painting scheme i am particularly proud of that i have applied to my 10 Hex Wraith mounts. I don't consider myself a particularly amazing painter and so i am quite proud of my grasp of wet blending. My forge world wight king BSB. Greg i can sympathise on the banner. Its amazing but the tattered effect just makes it so hard to work out what it actually is. 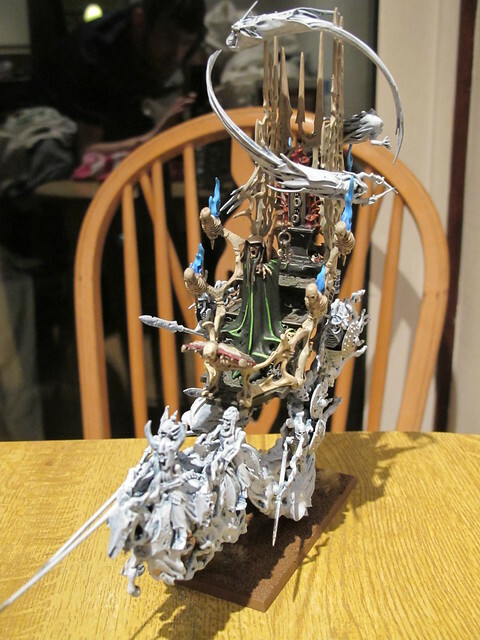 So todays project: Mortis Engine, bring it on! Looking great! I'd love to see a shot of the hexwraith mount without the flash, the blending looks nice but it's hard to see with the flash. 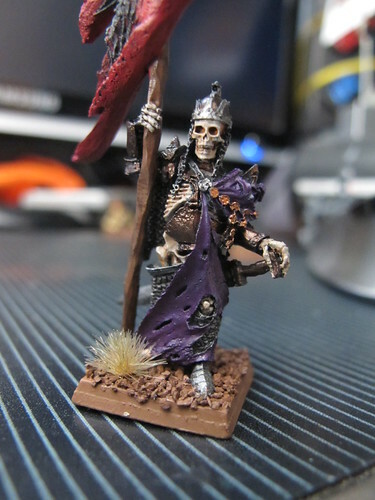 Oh, I really love the unit filler in the skele block! Keep it coming! Thanks man, that looks great! Have the mortis engine built into sections for painting, got the basecoat wash and 1st highlight on the spirit host and banshees. Also painted up the stone section on the throne and artefact plinth. 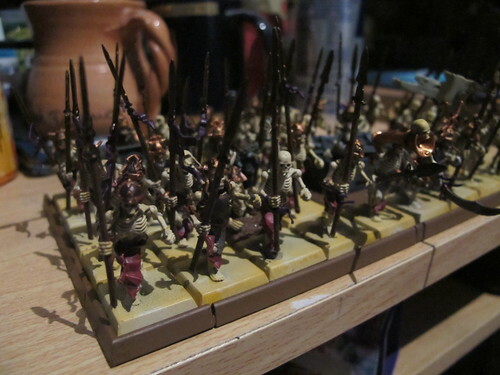 Will hopefully charge up the camera tomorrow, im planning on completing the whole thing tomorrow sans basing. 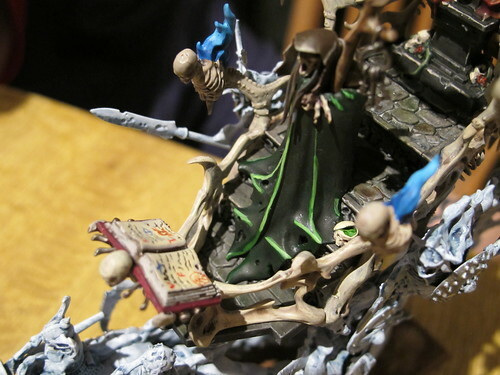 Woah, that model (Mortis Engine) is such a BEAST! 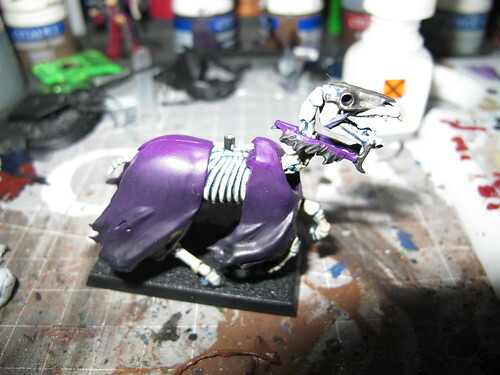 I love the work on the cloth of the Skeletal Steed. Very smooth transition. Yeah its looking AMAZING so far i cant wait to get it all put together at the end!! 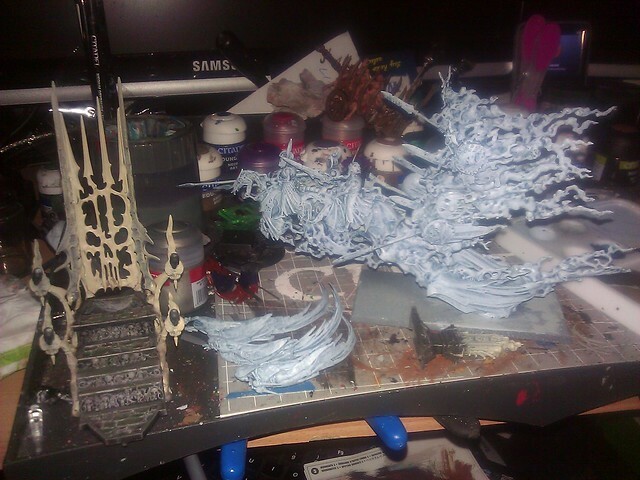 Stay tuned as i finish the coven throne tomorrow and possibly base coat some vargheists. Sadly my hobby time today is quite restricted so i have been building zombies. 60 down around 60 to go. So here we are, pics time! The solution to the "How will i transport it" problem. 3" pluck foam from battlefoam. 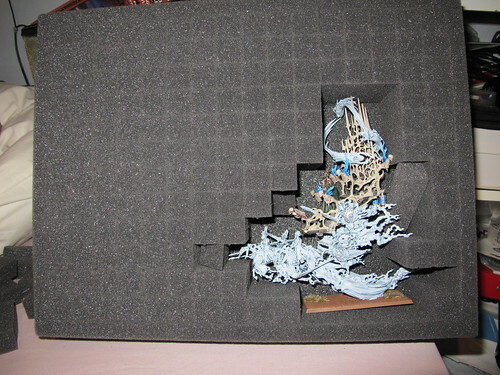 Also by the looks of things i will be able to fit a coven throne and my corpse carts in there as well as a few tall bits like standard bearers etc. It is worth noting that the kit includes a front gate that is supposed to be on the bone enclosure but i loves the artifact and spent so much time painting it that i really didn't want to cover it up so i left it off. Only problem with this is it makes it a little tougher to attach one of the banshees as you have to find another anchor point. But it worked out ok. I really like the green of the necro, stands out nicely against the rest of the model. I see about 5 bases for all those zombie bits, that's going to be some crazy work there! Also that pile of unassembled zombies gives me nightmares! Hope you can make the horde even larger with some unit fillers! Thanks noah! I was pleased with the green myself, makes the chap quite distinct as he is the only green wearer in the entire army. Echunia, you win a cookie for getting the references! 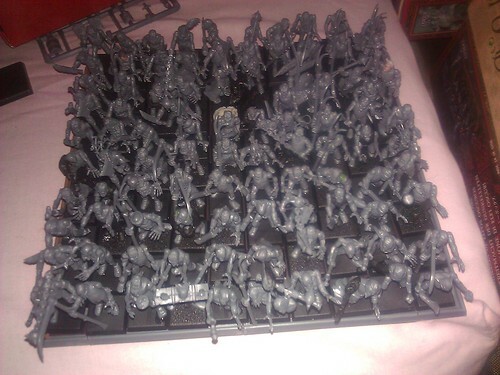 Tomorrow i have a game booked at my local GW and was hoping on having the VC ready to play (if not painted) so that means, at this point in the night, i have to build another 23 zombies + spares for invocation, get my vampire lord undercoated and stuck to her scenic base (which i have to paint, at least in the fiddly bits) and finidh my corpse cart. That seems pertinent to this particular endeavour. 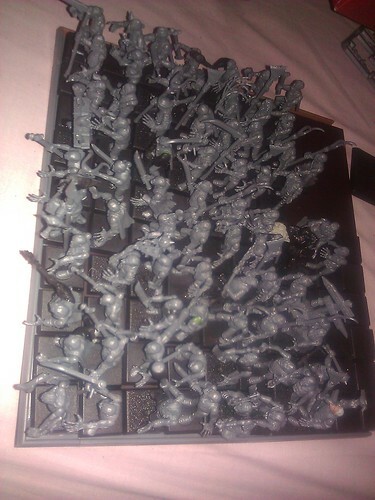 Also if anyone is interested i am going for a 100 man (zombie) unit which is constructed of 4 boxes of zombies, 2 boxes of flagellents, miscelaneous empire crewmen, 20 empire state troops and other bits n bobs i found in my bits box. This keeps them all looking a little different, i was concerned about obvious repetition on such a large horde. Wow...that's the way I imagine zombies: a giant horde. Honestly, I'd throw in a couple unit fillers. It'll give you some diversity in what you're painting and some focal points within the giant unit. 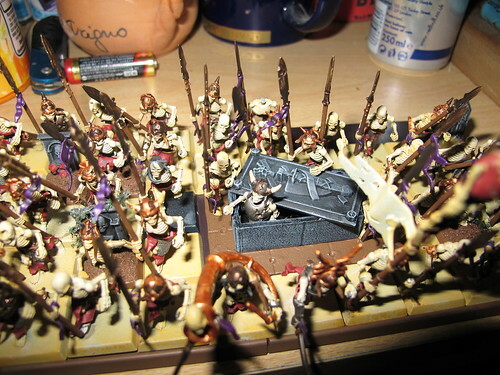 Maybe a 40mm diorama of some zombies overwhelming an empire soldier or some such thing. Then you can use some of the zombies you replaced as extra for raising.